‘Husk’ is the first product of an ongoing collaboration between Jonathan Coleclough and murmer. They first met in 2002 after appearing on the compilation LP ‘Chaleur’, and soon began work on the material that would become ‘Husk.’ Sharing a fascination with ‘found sound’, ‘Husk’ includes recordings of refrigerators, thunderstorms, sheep, car horns, ferryboats, windblown sand, crackling charcoal, as well as more conventional instrumental sounds including a variety of percussion. Much of the music started as live improvisation, in one case during a radio broadcast on McGinley’s regular ‘Framework’ slot on the London-based Resonance FM. These live recordings have been carefully edited and mixed over several years. ‘Husk’ is packaged in a 6-panel Digisleeve featuring photographs by Patrick McGinley. The first 200 copies of ‘Husk’ included a second CD of pieces recorded over the same period. A further 47 copies (only 25 of them for sale) included both CDs plus an additional uniquely packaged CDR, each one containing a unique composition. The music for these CDRs is based entirely on recordings made in McGinley’s London home during April 2006, his final month there before moving to France. In his previous collaborations with Colin Potter, Andrew Chalk, Tim Hill and most recently Lethe, Jonathan Coleclough has demonstrated his ability to distil sonorous frequencies, impressionistic tones and smeared ambiences from any given source material or field recording into supernal, droning compositions. Patrick McGinley, aka Murmer, also manipulates field recordings and environmental sounds, often emphasising the tactility intrinsic to each of his sources. Together, they make a formidable duo. While the exact source materials for the four tracks on Husk aren’t specified, enough information can be gleaned from the sounds to connect the dots if one wishes. The 20 minute title track is a sinewy composition, bouncing distant metallic clangs and windswept debris across the stereo field, multiplying resonant shimmers into a chorus of singing electrons. After an undulating series of phasing shifts (reminiscent of Coleclough’s Period solo outing), ‘Husk’ crescendos on a threatening torrent of protracted, shadowy sonics. Approaching Pucara’ situates a vaporous drone behind an occasional growl from what sounds like a motor agitating a wire. The strategy of layering a tactile event on top of a fluctuating tone is a commonplace within the realm of dronescaping, and this piece is not the duo’s best. ‘Fieldwork’ and ‘Germ’ are more successful. The latter derives exquisite interplay from a tangled network of hissing textures, and the former surges with the bleak Isolationist language of Thomas Köner. Barring a flaw here or there, Husk stands as one of the finest drone records of the year. Both McGinley and Coleclough are men armed with microphones. You can see them crawling behind refrigerators, admist sheep or out on the street capturing the traffic. Of the two, McGinley is usually the one with a lesser extended sound treatment and leaving sounds as they are, whilst Coleclough is the man to treat the sound to such an extent that nobody can recognize the original. That is already a most promising start. Much of the material on this CD started as a live improvisation, at least that is what we are told, as it certainly doesn’t sound like it. After careful editing, which seems to me the work of Coleclough, the rest is spread over four long pieces. The first time around I was listening to this CD in a totally new house, in a new house block, with some work being carried out still. The occasional drilling outside interfered nicely into the music, which had a similar drone-like character, but in the end the whole thing is less rigidly orchestrated than the usual drone record. Field recordings of all sorts drop in and out with irregular intervals, thus creating a slow but lively mixture of drone-like sounds that go on, but change to quite an extent, and sounds dropping in and out. Bell like sounds, engines or whatever is hard to identify. This is quite a beautiful CD. Another fine addition to the small but great catalogue of both artists. 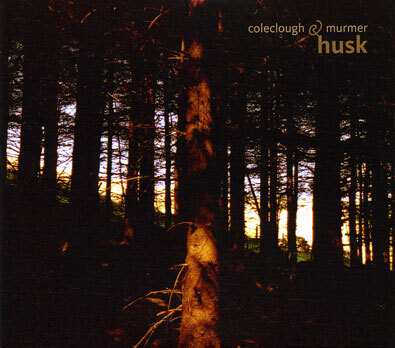 Besides the evocative photos by Patrick McGinley (aka Murmer) adorning the sleeve, no clue is given about the origins and the meaning of Husk, which signals Jonathan Coleclough’s return after Long Heat, his 2005 release with Lethe. The initial title track is a classic of obscure droning resonance, trademark Coleclough, all growing pressure, dark currents and menacing thunder. “Approaching Pucara” is a simpler collage where an agglomerate of low frequencies is disturbed by an irregular emission, while “Fieldwork” is almost musique concrète, a detailed fresco of traffic noise and natural sounds, with some object rustling for good measure. “Germ” is a slow, deep pulse enhanced by the passage of dazzling aural clouds, an addictive track with subsonic refractions changing with our movement in the room, like listening to a ghost choir accompanied by a distant aeroplane. Put your smart money on the special limited edition, though, because it features a bonus CD whose music is just as good, maybe even better. After the humming subterranean energy, irregular pulse and scraping of “Wend”, “Freon” juxtaposes an ever-present rumble with fumes of flanged waves extinguished by strings and tiny percussive clatters. The almost ritual percussive pattern about 12 minutes into the piece rings distant bells of early Jeff Greinke. “Pucara” closes the show with more metal percussion over another haunting chorale of undecipherable origin – voices, a processed/looped traffic jam or what? For you to discover.